Sadly, the reality of PR in most businesses is not that it focuses on a broad range of publics. The reality is that in most businesses, and most PR associations, is that PR is equated with media relations. Furthermore, public relations is widely disrespected within our organisations. It is often seen to fail to produce measurable benefits for the business. Even key industry bodies, such as the CIPR and PRCA, have failed in their own attempts to articulate measurable benefits. Because fundamental measurement projects like PREfix were doomed by internal convulsions, and therefore PR cannot argue its own benefit, then how can the PR organisations aid those trying to show that communications drives corporate performance? We would like it to be otherwise. Sadly, a thimble of lemonade cannot sweeten the ocean. We AR professionals are too few to shift PR’s reputation. Public relations is probably discredited permanently in the boardrooms as a hapless and technical embarrassment. Those who seek to defend and extend the reputation of PR face huge challenges, principally within their own camp. No-one can be surprised at the wealth of alternative titles in which media relations have wrapped themselves in search of greater credibility. That is why, for example, investor relations and employee communications professionals have their own organisations. They want to stay upwind of the stink. Hence the Investor Relations Society. I think a model here is the International Association of Business Communicators. Many of us are business communicators. However, in reality the IABC is a forum for employee communications specialists. But they use the label of business communicator because they want to indicate their understanding of the notion, which I share, that communications should be integrated. Sadly for us, the IABC is too tightly focused to meet our needs. Similarly, AR professionals are all engaged in relating with one of the many ‘publics’ that communicators are concerned with. However, we face the same dilemma as our colleagues in employee communications. AR has struggled to deliver value to businesses where it is identified as part of PR, because AR has been given to people who describe themselves as PR generalists but who are in fact media relations specialists. The attempt to apply actually-adopted media relations tactics to analyst relations problems would be simply laughable, were those tactics not so deeply problematic in their native domain. In fact, most media relations programs are weak even when applied to the media: their extension to analyst relations’ challenges is destructive. First time as farce, second time as tragedy. Of course, the originators of PR, like its theorists and educators, did not intend to create a monster; Neither did Doctor Frankenstein. 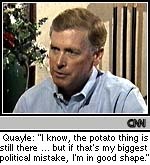 Similarly, Indiana University does not intend that its doctoral alumni should be unable to spell potato; Dan Quayle could not, however. The AR professionals who gathered in London could have allied with a PR body. Personally, I could have favored it. However, the fact that we have moved in the opposite direction shows AR managers’ perception of PR’s immense reputational risk. Working within a PR organization, we would have greater recognition, more support, less work, a captive audience and a lovely club house. However, the risk to our companies’ relationships with analysts would be massively endangered if we invited our media relations colleagues to consider AR as within their competence or purview. We remain a firm believer in the value of premium public relations, as we discussed in PR: Opportunities, obstacles and solutions. However, there is a massive gap between the PR we want and the PR that most of us actually experience.